Dr. Crandall was born in Buffalo, New York. He moved to Florida as a child and attended Eau Gallie High School in Melbourne FL. He graduated early and went on to Emory University in Atlanta, Georgia. There he completed his Pre-Med requirements in 3 years and entered Emory University School of Medicine. He received his degree, Doctor of Medicine, in 1974. Dr. Crandall then joined the U.S. Army and completed his Family Practice Residency at Silas B. Hays Army Hospital at Ft. Ord in California. He became board certified in 1977, practiced medicine there for 2 years, then moved back to Melbourne to practice medicine with his father until 1984. In 1984 Dr. Crandall made the decision to do a second Residency Program in Obstetrics & Gynecology, at Madigan Army Medical Center in Ft. Lewis, Washington. He completed his program there and has been Board Certified in Obstetrics & Gynecology since 1989. After serving his country for 10 years, he left the Army, and started his current practice in Naples, FL in 1989. He is on staff and active at both Naples Community and North Collier Hospitals. He has held the titles of Dept. Chairman & Vice-Chairman, Dept of OB/Gyn at Naples Community Hospital. 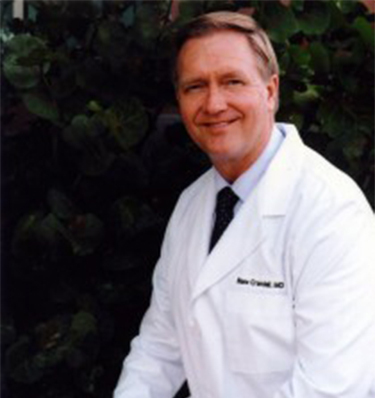 He is regarded as an innovator in the area having pioneered laparoscopic surgery in Collier County. He has been involved in many Clinical Research Studies and has authored articles on these studies. He continues to stay on the cutting edge of his medical specialty. He is a fellow of the American College of Obstetrics & Gynecology, and a member of the American Medical Association, the FL Medical Association and the Collier County Medical Society among others. Most recently he was recognized as one of the BEST DOCTORS IN AMERICA, and was presented the prestigious “2003 Physician of the Year” award by the U.S. Senate. Dr. Crandall has been married to Doshie (our office administrator) since 1968, they have 4 children and 4 grandchildren. In his free time Dr. Crandall enjoys family activities, golf, travel, and working out. Family Practice Partnership with Clarence R. Crandall, M.D. Crandall BM, Kauramaki NA, Wilson AF, Coughlin MR: An Investigator-Blinded Multi-center Trial, Comparing the Efficacy and Safety of Vagistat 1 (Ticonazol 6.5%) Vaginal Ointment and Monistat 7 (Miconazole Nitrate 2%) Vaginal Cream in the Treatment of Patients with Vulvovaginal Cadidiasis. February 1994 – October 1994. Crandall BM, Kauramaki NA, Heitmann J., Thompson SW, Collins KJ, Wilson AF, Coughlin MR, Foglesong JJ, Maddox DJ: An Open-Label, Randomized Parallel Group Comparative, Multi-center, Safety and Efficacy Study of Triphasic Combination Oral Contraceptives. October 1994-February 1996. Crandall BM, Kauramaki NA, Foglesong JJ, Wilson AF, Coughlin MR, Maddox DJ: An Investigator-Blind Comparative Trail of CP-116, 517/CP-99-219 and Ofloxacin/Clindamycin for the Treatment of Acute Pelvic Inflammatory Disease (PID) In Ambulatory Subjects. April 1995-January 1996. Crandall BM, Kauramaki NA, Foglesong JJ, Wilson AF, Coughlin MR, Maddox DJ: A Double-Blind Multi-center Trial Assessing the Safety and Efficacy of Intravenous CP-116, 517 Followed by Oral CP-99,219 Compared with Intravenous Celoxltin Followed by Oral Amoxicillin/Clavulanic Acid for the Treatment of Acute Pelvic Infections. June 1995-December 1995. J. Thomas Cox, M.D., Principal Investigator, Blane Crandall, M.D., et al: N-tional Multi Center Observational Registry for the “Investigation of Current Practices for the Treatment of ASCUS and HPV Positive Patients” – May 2002-May 2003.